Life's Fortune Vitamins - Advanced Energy Support. Official Website. 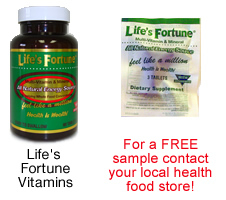 Life's Fortune® Multi-Vitamin & Mineral Advanced Energy Support Supplying Whole Food Concentrates. There is one thing that everyone wants when they take supplements, INCREASED ENERGY! Within 28 minutes of taking Life's Fortune®, your body begins to feel the power of this synergistic blend of vitamins and whole food concentrates. TOGETHER, THEY RELEASE A REAL BURST OF ENERGY - GUARANTEED! NPA (National Product Association) TRULABEL Registration & Lab Tablet Testing assures you of purity and high quality. Life's Fortune® disintegrates within 28 minutes for better absorption. Please call 1-800-714-2322 or send email for an independent health food store in your area, Today! Life's Fortune® is a complete food supplement that contains a combination of superior balanced vitamins, minerals, antioxidants, and enzymes in an exclusive whole food base. The potency of each vitamin and mineral in Life's Fortune® was selected in such a way that nutrition in balance would occur in the proper ratio and harmony. This process causes the body to quickly and easily assimilate them. These balanced nutrients supply the fuel that sparks the electric vibrations the body need to function at peak mental and physical efficiency. The entire family can have the advantage of a top quality whole food supplement for just a few cents a day - GUARANTEED! this incredible nutritional breakthrough resulted from over 40 years of nutritional experiences!